Perhaps not the best choice of words, but it made you want to read more, right? Your subject lines need to grab your target audience in the same way your headlines for print ads do. Your prospects and customers receive an awful lot of e-mail and if your subject line doesn’t make a case for opening the e-mail you’re sunk. Poor subject lines fall into two camps. In one, the subject line tries to be catchy or trendy and ends up having nothing to do with the actual content of the e-newsletter. On the other side, you have the subject line that sits on the page like a manhole cover, doing nothing to entice the reader to click and find out the rest of the story (forgive me, Paul Harvey). As crude as the above headline might be, you knew what this section was about and the angle. It certainly catches your eye more than a title of “Why subject lines are ineffective.” You may choose different verbiage for your publication, but make your subject line catchy and specific to the story subject. To write better subject lines, you really need to focus on the benefit of the story to the reader. If you write a story on a new company offering, the subject line should not read, “Company Y introduces new widget.” It should be more like “New widget improves production speeds by 10%”. Make it about what’s in it for your readers and not what your company just did and you are halfway there. If you do not have somebody on your staff with the skill to hit that high note, then hire a copywriter. There are plenty of freelancers out there ready, willing, and able to craft an e-newsletter with subject lines that leap off the page. And for a reasonable price, too. 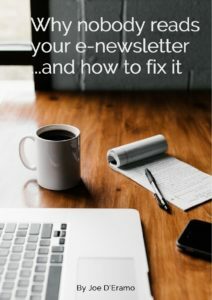 This blog was taken from “Nobody Reads Your e-Newsletter…And How To Fix It.”. In 2017, the battle for attention in the in-box rages on. If you want them to open, you have to grab their attention in the subject line. That’s a pretty good reason why nobody reads it. If your company does not have an e-newsletter and you downloaded this report, chances are you know it’s something you should do. And why not? An e-newsletter provides another way to get in front of your current and former clients in an unobtrusive fashion. Get one and commit to putting out an issue at least once a quarter. But honestly, if you really want to reap the benefits, make it monthly. By regularly publishing an e-newsletter or some other communiqué, you improve the odds of former clients becoming current ones; and lessen the likelihood of current clients, now adequately informed, turning to the competition for a service they didn’t know you offered. That alone more than covers the cost of putting out an e-newsletter (relatively affordable with e-mail marketing programs like Constant Contact, which can run for as little as $20 per month, depending on your e-mail list. Or even free e-mail marketing platforms like MailChimp. The goodwill you create with your client base with regular communication is an added bonus. It’s a win-win, but only if you do it right. The last version of Why Nobody Reads Your E-Newsletter came out several years ago. Since then, much has changed about e-newsletters. Much is still the same. With all the hype about social media, e-newsletters remain an essential part of any company’s arsenal. Especially since the content created for e-newsletters can easily be repurposed for social media. Which “Stand by Me” character were you? That’s the last line from the movie,Stand By Me, which starred the late River Phoenix and pre-Star Trek/Big Bang Theory’s Will Wheaton. A copywriter friend and I were discussing that last line and how friendships can take a turn after you become teenagers and start hanging out with people with whom you have more in common than what class you are in or where you live. We both agreed we were more like the Will Wheaton character. He played the writer who, following the death of one of his boyhood friends, reminisces about an adventure he and his crew had in retrieving a dead body on the outskirts of town. While none of my friends resembled the River Phoenix’ character, Chris, my friend said one of his buddies did. The friend was still very much alive, though he’d recently been dealt a setback—cancer. Yet as my copywriter friend talked about his boyhood friend, the similarities were astounding. His friend was a protector of the weak. He’d stand up to bullies who picked on friends. Neighborhood legend has it he once got in the middle of a shouting match between an inebriated husband and his wife. Again, protecting those who could protect themselves. In Stand by Me, the River Phoenix character, as an adult, was stabbed breaking up a fight. My friend said he remembered his buddy being involved in a fight against somebody with a knife—actually two people. He fared a little better than the River Phoenix character, knocking the knife to the ground and delivering a pretty healthy beating. “What about the other characters from the movie? Did you guys have anybody like that in your crew?” I asked. My friend said he and his buddy used to hang out with his younger cousins. They didn’t have their cousin’s courage, but made up for it in loyalty—just like the characters in the movie. My friend responded no. Mostly just fun hanging out and doing the things kids did when you were that age: street hockey, skating on frozen ponds, sledding, pick-up wiffle ball games, playing catch with the Frisbee in the front yard. As the conversation started to lag, I asked how his friend was doing now. The look in my friend’s eyes when he said that sent a bit of a chill down my spine. But I could see the devotion not of a middle-aged man, but of a 12-year-old boy whose buddy had been delivered a pretty significant blow. It was the look of somebody a little scared but confident that the boy he viewed as a hero would whip cancer the way he stood up to neighborhood bullies. It made me think of my own friends from childhood and how true that line from Stand By Me was. And it’s yet another reason why on August 2, I’ll be riding a bicycle from Wellesley to Bourne to raise $3200 or more for the Jimmy Fund/Dana Farber as part of the Pan Mass Challenge. If you like to remember a friend you lost to cancer, there are few better ways than donation to a Pan Mass Challenge rider. One hundred percent of your donation will go to the Jimmy Fund/Dana Farber. That’s right, 100 percent. Make your donation today.